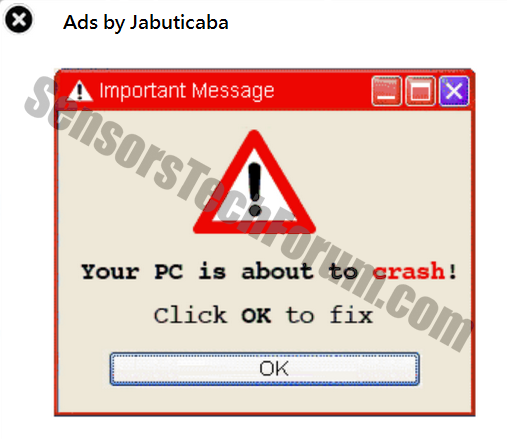 Short Description The pop-ups by Jabuticaba may trick users into believing their PCs are about to crash. Symptoms Browser slowdowns, intrusive display of pop-up windows and advertisements. Distribution Method In freeware packages under the advanced/custom option, or visiting corrupted websites. What Are Ads by Jabuticaba? If you start seeing advertisements on while browsing labeled as “Ads by Jabuticaba,” then there surely is an adware program on your PC. The program, of course, is called Jabuticaba. This adware program can produce pop-up and banner ads, and it is compatible with Internet Explorer, Mozilla Firefox, and Google Chrome. You should know that adware programs are generally considered unwanted, and this is not just because they can be really irritating. Ads by Jabuticaba are intrusive. What is worse, they may even expose your computer to virtual threats. This is why it is best that you get rid of the adware as soon as possible. How Did Ads by Jabuticaba Appear on My PC? 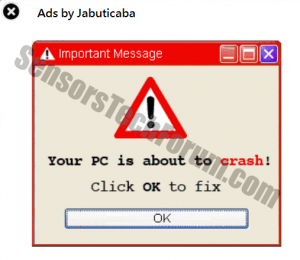 As we already established Ads by Jabuticaba are produced by an adware program. Advertisement-supported programs are very cunning when it comes to infiltrating computers without being noticed. They do this through bundled downloads. They are attached to installers of free programs. This way, they managed to get installed on systems unbeknownst to users. To avoid this, it is best not to download software from third-party distributors. Another thing to do is opt for Custom/Advanced installation. This will allow you to decline the installation of any additional software. What Is the Problem with Ads by Jabuticaba? Once the adware has been installed, it will start producing pop-up and banner advertisements. The ads will present various promotions and deals. They will appear constantly while you are browsing the web. These can really annoy users as there is no way to get rid of them. Keep in mind that the adware program is able to collect data on your browsing, which should help it deliver targeted ads to each user. What is more, this information can even be shared with third parties. The thing that you should really worry about, however, is the fact that some Ads by Jabuticaba can be misleading. Some ads may lead to malicious websites. There you can become a victim of a phishing scheme. Another possibility is that the websites will attempt to infect your computer with some malware. Then, you can have serious issues with operating your system. What is worse, the infections will most likely target your sensitive information. This means that cyber criminals will then be able to steal all of your money, along with your identity. Due to these risks, it is strongly recommended that you remove Ads by Jabuticaba as soon as possible. How to Remove Ads by Jabuticaba? Getting rid of adware programs is usually fairly easy. You need to go to Control Panel, open the list of programs, find the adware, and uninstall it. In this case, the program will be called Jabuticaba. Sometimes, however, adware program are harder to remove. If you continue to view Ads by Jabuticaba, then the adware continues to be active. In this case, it is recommended that you acquire a reliable antivirus program. This will get rid of all adware along with any malware programs that may have infiltrated your computer. This is the best and most secure way of making sure that your system and all information on it is safe at all times. Follow the instructions above and you will successfully uninstall Ads by Jabuticaba. After Ads by Jabuticaba is removed, restart Mozilla Firefox by closing it from the red “X” in the top right corner and start it again. From the opened “Extensions” menu locate Ads by Jabuticaba and click on the garbage bin icon on the right of it. After Ads by Jabuticaba is removed, restart Google Chrome by closing it from the red “X” in the top right corner and start it again. Select Ads by Jabuticaba to remove, and then click ‘Disable’. A pop-up window will appear to inform you that you are about to disable the selected toolbar, and some additional toolbars might be disabled as well. Leave all the boxes checked, and click ‘Disable’. After Ads by Jabuticaba has been removed, restart Internet Explorer by closing it from the red ‘X’ in the top right corner and start it again. A pop-up window will appear asking for confirmation to uninstall Ads by Jabuticaba. Select ‘Uninstall’ again, and the Ads by Jabuticaba will be removed. 3. Remove Ads by Jabuticaba automatically with Spy Hunter Malware - Removal Tool. 3. Remove Ads by Jabuticaba automatically with Spy Hunter Malware – Removal Tool. Threats such as Ads by Jabuticaba may be persistent. They tend to re-appear if not fully deleted. A malware removal tool like Combo Cleaner will help you to remove malicious programs, saving you the time and the struggle of tracking down numerous malicious files. Threats such as Ads by Jabuticaba may be persistent on your system. They tend to re-appear if not fully deleted. A malware removal tool like SpyHunter will help you to remove malicious programs, saving you the time and the struggle of tracking down numerous malicious files. Note! Your computer system may be affected by Ads by Jabuticaba and other threats. SpyHunter is a powerful malware removal tool designed to help users with in-depth system security analysis, detection and removal of threats such as Ads by Jabuticaba. 1. Install SpyHunter to scan for Ads by Jabuticaba and remove them. 2. Scan with SpyHunter, Detect and Remove Ads by Jabuticaba. Ransomware infections and Ads by Jabuticaba aim to encrypt your files using an encryption algorithm which may be very difficult to decrypt. This is why we have suggested several alternative methods that may help you go around direct decryption and try to restore your files. Bear in mind that these methods may not be 100% effective but may also help you a little or a lot in different situations. Note! Your computer system may be affected by Ads by Jabuticaba or other threats. Remove Ads by Jabuticaba by cleaning your Browser and Registry. Fix registry entries created by Ads by Jabuticaba on your PC. Combo Cleaner is a powerful malware removal tool designed to help users with in-depth system security analysis, detection and removal of threats such as Ads by Jabuticaba. Step 5: In the Applications menu, look for any suspicious app or an app with a name, similar or identical to Ads by Jabuticaba. If you find it, right-click on the app and select “Move to Trash”. Step 6: Select Accounts, after which click on the Login Items preference. Your Mac will then show you a list of items that start automatically when you log in. Look for any suspicious apps identical or similar to Ads by Jabuticaba. Check the app you want to stop from running automatically and then select on the Minus (“–“) icon to hide it. Remove Ads by Jabuticaba – related extensions from your Mac’s browsers. A pop-up window will appear asking for confirmation to uninstall the extension. Select ‘Uninstall’ again, and the Ads by Jabuticaba will be removed. When you are facing problems on your Mac as a result of unwanted scripts and programs such as Ads by Jabuticaba, the recommended way of eliminating the threat is by using an anti-malware program. Combo Cleaner offers advanced security features along with other modules that will improve your Mac’s security and protect it in the future. 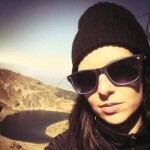 Hey !, I found this information for you: "Remove Ads by Jabuticaba and Stop Pop-Ups". Here is the website link: https://sensorstechforum.com/remove-ads-by-jabuticaba-and-stop-pop-ups/. Thank you.